This timely and pertinent collection looks at the variety of questions involved in the operation of Commissions of Inquiry (CoIs). Traditionally existing as pure fact-finding bodies, in recent times the function of CoIs has arguably shifted and broadened so as to provide a form of legal adjudication. This shift in their application merits scrutiny and this edited collection of essays addresses institutional and procedural aspects of CoIs, as well as issues in regards to the application and interpretation of the substantative law applied to them. Essay topics include the relationship of CoIs with, and impact upon, traditional forms of adjudication, the influences of international law upon the work of CoIs, through to issues of procedural fairness. 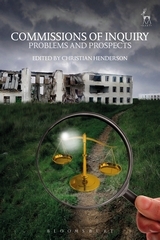 Drawing upon the expertise of scholars working within in the field, it offers an insightful and critical analysis of CoIs. 11. Selectivity and Choices in Human Rights Fact-finding: Reconciling Subjectivity with Objectivity? Christian Henderson is Professor of International Law at the University of Sussex.